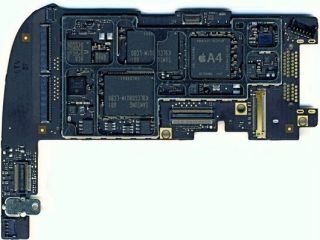 Not only has the new Apple iPad been torn apart by the team over at iFixit, it has also been X-rayed, to allow us all a much closer look at what is inside the new device from Cupertino. iFixit, working with reverse engineering firm Chipworks, tore apart and X-rayed the iPad's central processing hub. The resulting findings confirm that the A4 is built using a "package on package" method, so the 256MB of Samsung-provided SDRAM sits right on top of the CPU, which is reductive to latency and energy use. iFixit concludes that the iPad seems to be running on a Cortex A8 – but Engadget notes that "their assertion that it couldn't be a Cortex A9 MPCore inside is inaccurate, as those chips also come in single-core options. It will be interesting to compare performance with Samsung's own Hummingbird chip - designed by Intrinsity, the chip company Apple is rumoured to have recently acquired.